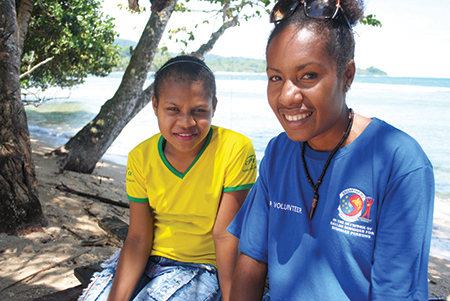 Recently Prisca, who trained as a Community Based Rehabilitation (CBR) Volunteer, was out in her village talking about MMI’s Inclusive program when she was approached by a mother asking for help with her daughter, Sila. Prisca met with Sila, who is 14 years old and has a visual impairment and discovered that for Sila, school started to become too difficult for her when she was unable to see the board or read her books. In grade 5, with her teachers busy with other students, Sila began feeling like she wasn’t being included and decided she didn’t want to go to school anymore. Sila was referred to classes at Callan Services with a goal of building her confidence to re-enter mainstream school. Thanks to your compassion and committment to MMI and Prisca’s referral, Sila now has a new lens to help her read and has rediscovered her passion for reading and education, helping to make a brighter future possible. Timor-Leste has one of the poorest outcomes for preventable diseases in all of Asia. MMI’s Health Literacy program works with teachers in the most remote communities to engage children in health education and awareness through interactive games, music and drama. 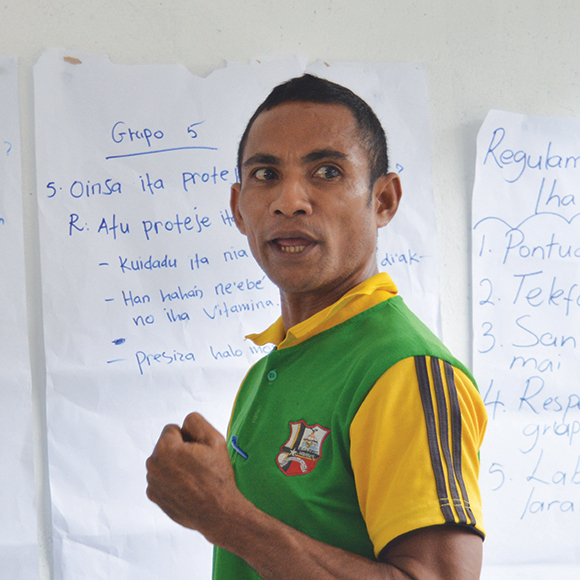 Recently, Jude, a 37 year old teacher in Viqueque, was happy to attend MMI’s training, as all the information on health and hygiene was new to him. Jude found that after the training, all of those who attended started to think about promoting healthy behaviour by making their own rubbish bins with wood. Jude met with his Director to share his idea and was supported with money to build a big rubbish bin to put in the middle of the school. Now students throw their rubbish in the bin that was built by the teachers! Jude said that he is thankful to MMI and our supporters for being able to help create a healthy environment in his community.